(Natural News) If you like snacking on peanuts, you can grow some in your yard or even in a large pot. It may come as a surprise, but peanuts aren’t really nuts. Originating from South America, it’s technically a legume, and is related to peas and beans. Peanuts take about 120 days to mature. Peanuts can grow even in light spring and fall frosts. If you’re growing it in a home garden, try a productive variety called Jumbo Virginia. The peanut plant is often classified as a Southern crop, but Northern gardeners can also grow them. However, when grown in the North, you will need early cultivars like Early Spanish that is first planted indoors. Peanuts need full sun to grow. If you plant peanuts in heavy soil, working in the proper amount of organic matter will make it loose and friable. Friable soil crumbles easily, and this will ensure good drainage. Peanut seeds, which come in their shells, may be planted hulled or unhulled. If you shell peanuts, don’t remove the thin, pinkish-brown seed coverings. Once you remove the seed coverings, the seed won’t germinate. If you’re growing peanuts in the North, start by planting them indoors in a large peat pot at least one month before the last frost. Sow seeds an inch deep and keep the pot in a very sunny area. Water the pot once a week. Once the seedlings sprout, transfer them to the garden when the soil warms to between 60 and 70 F. Keep transplants about 10 inches apart and don’t damage or bury the crown. When growing peanuts in the South, plant them outdoors near the date of the last expected frost. Plant the seeds two inches deep and five inches apart in rows that are two to three feet apart. Firm the soil and water well, then eventually thin plants to 10 inches apart. Once a peanut plant grows to around a foot tall, hill the earth by the base of the plant. Peduncles (long, pointed pegs) will grow from faded flowers and these pegs will push one to three inches down into the soil beside the plant. A peanut will form on the end of each peduncle. Lay down a light mulch, like grass clippings or straw, so the soil surface doesn’t crust and the pegs can easily penetrate the soil. Give each plant at least an inch of water weekly. Legumes have their own nitrogen supply, so don’t use nitrogen-rich fertilizers (this will encourage foliage instead of fruits). Peanuts will thrive in well-prepared soil, which has all the nutrients it needs. You can harvest your crop when the leaves turn yellow and the peanuts’ inner shells show gold-marked veins. 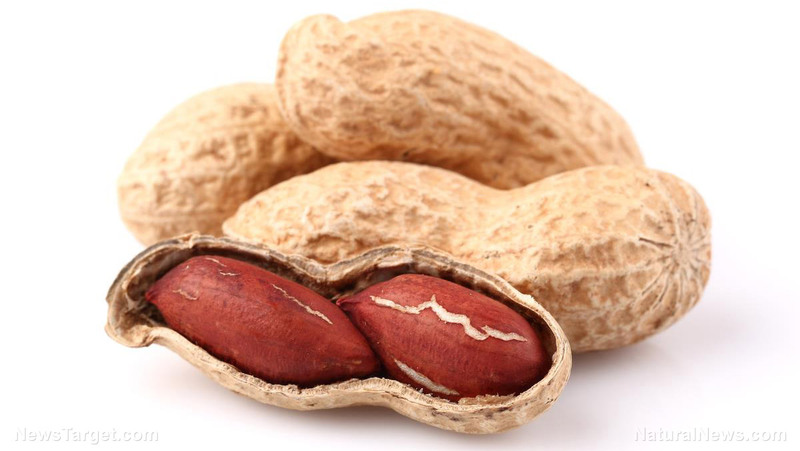 Check the peanut shells regularly by pulling out a couple of nuts from the soil and shelling them. Don’t wait too long before harvesting the plant because the peduncles will turn brittle. Once this happens, the pods will break off in the ground, and harvesting will become more difficult. Pull or dig the peanut plants and roots when the soil is moist. Gently shake off the excess soil, and let plants dry in a well-ventilated area until the leaves become crumbly, then remove the pods. Keep unshelled peanuts in airtight containers. When stored properly, unshelled peanuts can last for at least one year. In the U.S., peanuts are rarely eaten raw. They are either consumed as roasted and salted whole peanuts or as peanut butter. Peanuts can be used to make peanut flour, oil, and protein. Peanut products are used to make different kinds of foods like cakes, confectionery, desserts, snacks, and sauces. Peanuts taste creamy and crunchy, and they are full of fat, protein, and other essential nutrients. You can read more articles with tips on how to plant peanuts in your garden at HomeGardeningNews.com.